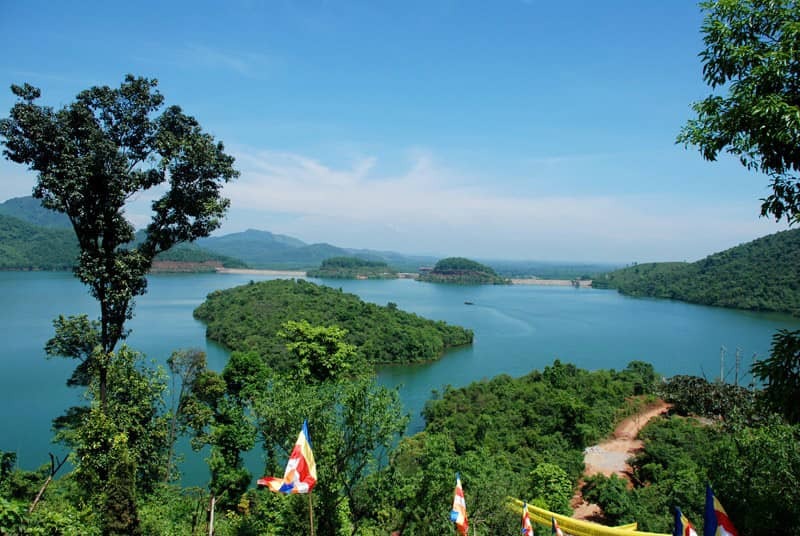 Bach Ma National Park is 60km in the south of Hue city and 50km north of Da Nang City. Here the plants are plentiful and lush all year, animals are also diverse and there are countless kinds of birds. Bach Ma mountain range is the natural border between Hue and Da Nang featuring difference weather at 2 sides of the Mountain. Bach Ma Mountain is interested for its well-known biodiversity resources of many rare animals and plants. For those who love the wild, simple, quiet nature, Bach Ma National Park is a treasure. With an area of ​​over 22,000 hectares, Bach Ma national park is one of the largest nature reserves in Vietnam. Come here, you are spoiled for discovering rare flora of Bach Ma forest. There are many ways to reach the Bach Ma National Park, but it would be great and fun to explore the Bach Ma nature trail, by any chance visitors can catch mesmerizing scenery at any time. The forest flowers are colorful mixed with green leaves of the forest. Go to Bach Ma National Park, you can also conquer Bach Ma peak with altitude of 1,450m above sea level. And then, from the top of the mountain, you can take a panoramic view of Hai Van Pass, Tuy Van Mountain and the sparkling lights of Hue and Da Nang city. Here below are some points of interest for a trip to Bach Ma Mountain. 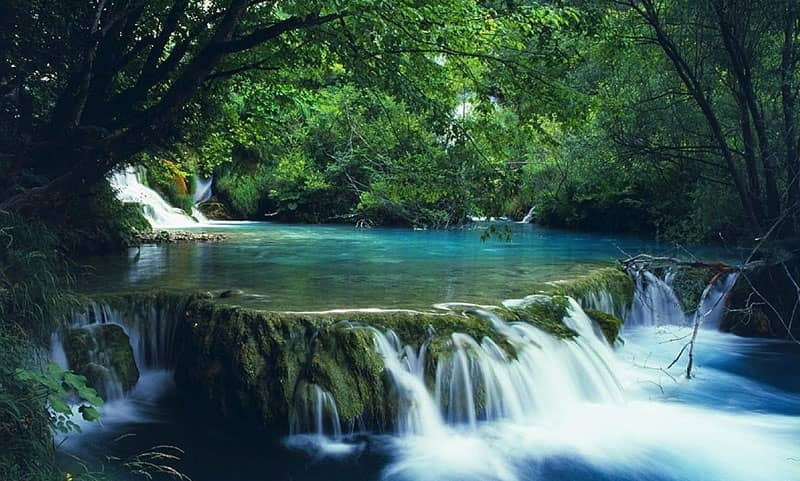 The best time to visit Do Quyen waterfalls is in spring. 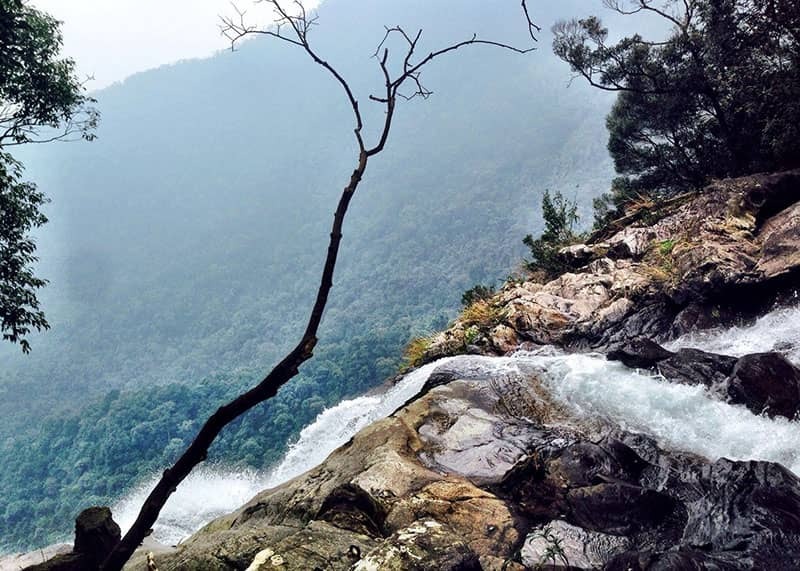 With a height of about 300m, the waterfall spreads white froth all the year, looking down from the top you will see the endless mountain hills. Do Quyen waterfall the name itself means rhododendron because this kind of flower grows on both sides of the waterfall and usually blooms in March. With a 30 minute walk, the mountain trail will take you to a series of beautiful waterfalls beside the lush, romantic green lakes. The Five Lakes is a collection of five lakes at five different points, according to many people have been going there, the third lake is the most beautiful. Water in the lake is very clear and cold, on the lake, the waterfall cascaded down makes a very beautiful and fascinated look. Do not forget to bring a camera or camcorder, as it is sure that the pictures you take at these lakes will be beautiful pictures that are not easy to get. You can also swim in the lagoon if you are healthy and tolerate cool water here. 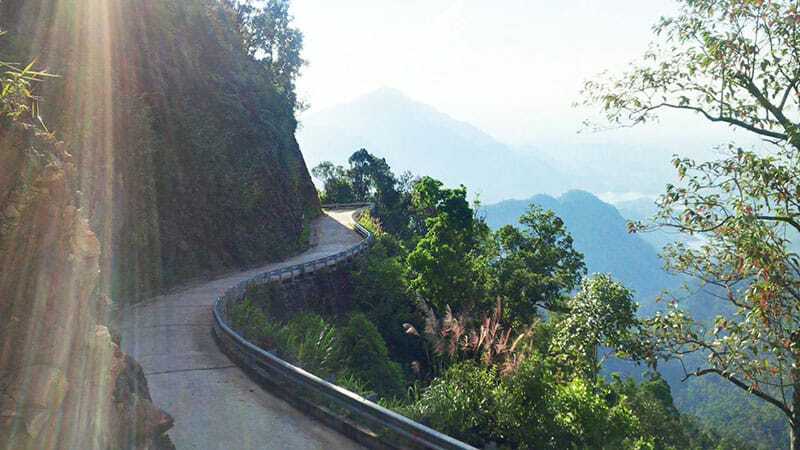 Compared to the Five Lake trail, the Vong Hai trail, the Do Quyen trail, the Star Pheasant trail seems to be the least mentioned. It is a fact that the trail is also attractive as other trails. Not simply a trail with a walkway and trees along the side of the walkway, visitors will sometimes have to climb mountains, cross the light forest. The end point of the trip is the waterfall with the water flowing through each stone. The pause of this flow is a lake with clear water, revealing even a mossy slab of stone. If you are lucky enough in your conquest, you will find somewhere the rare hemorrhoids. Coming to this forest you will see many majestic ancient trees growing close together, there are trees with diameter over 1m and over 30m high. Black parashorea is a large tree species of wood, straight, tower-shaped. The tree is good wood, pinkish yellow or brownish gray, yellow, depending on the site conditions, diagonal but easy to split, water resistant including salt water. On the Black Parashorea Forest trail, you can hire guides to use the leisure and entertainment services of the air by sliding cable or climbing on the grid several feet above the ground. 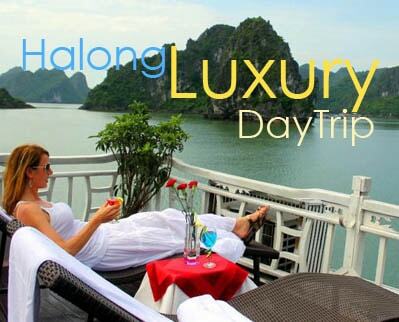 This is an ideal opportunity for you to explore the tropical forest on the immeasurable high foliage, and to leave beautiful and unique pictures of your mountain discovering trips. Truc Lam Bach Ma monastery surrounded by Truoi Lake, located on Linh Son Moutain. To reach the monastery, you take about 15 minutes to go through Truoi Lake by ferry. 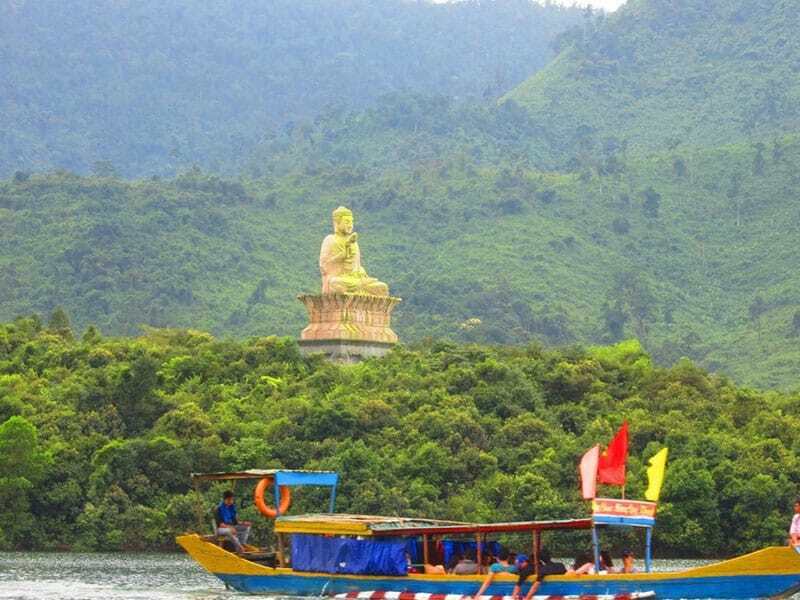 Take a look surround, you will see the white clouds floating on the bottom of the clear blue lake; Contemplate the statue of Buddha Shakyamuni meditating on a hill in front of the pagoda in the middle of the lake. The statue has the height 24 m and the weight 1,500 tons, made of stone. 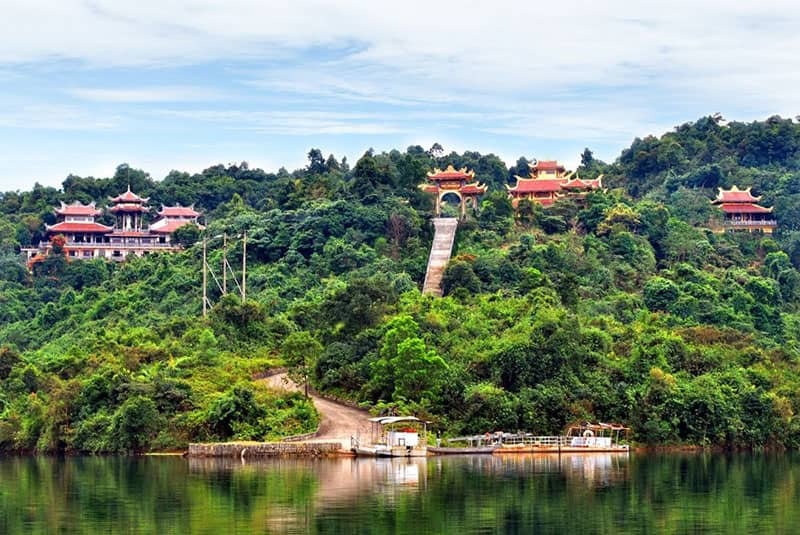 On the other side of the lake, there is a construction of Truc Lam Bach Ma monastery hidden in Linh Son Mountain with hazy clouds around the year. Just finishing the 172 steps, you will the gate of the monastery meditation soaring, majestic in the blue sky, white clouds. At this time, you can admire the architectural works of the monastery was harmoniously built in a population with the road, the main power, roads, clerks, staff, bell tower, relics… clusters on Pristine forest. Alternating in the gardens, the forest is a precious tree, flowers are beautiful which are collected and cared by the Buddhist monks and nuns. You should book services and bring warm clothes, trekking shoes. Motorcycles or bus over 30 seats are not allowed on Bach Ma Mountain. 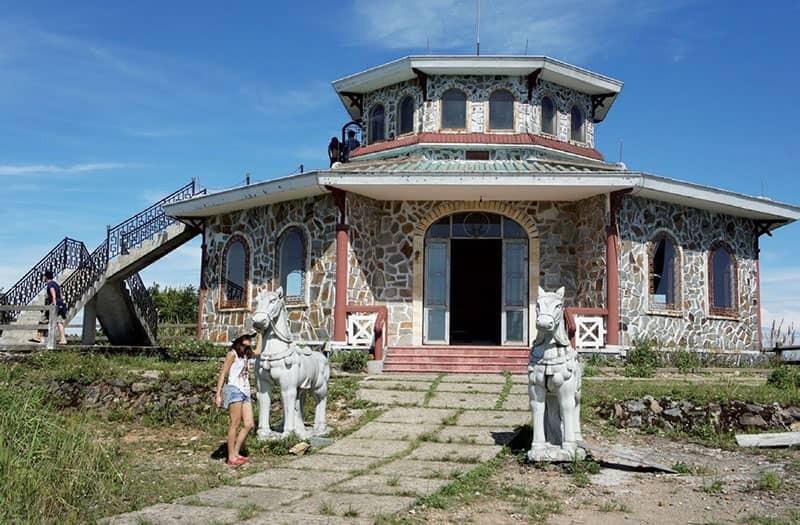 Do not expect at Bach Ma luxury hotels, dance floor, karaoke bars or food and souvenirs originating from forest animals. You may be fined if you litter, pluck, break the plant or otherwise violate the regulations in Bach Ma.